TS Lidia will be the main focus of attention here in Southwest over Labor Day weekend, while much of eastern U.S. will be watching Hurricane Irma as it crosses the Atlantic. 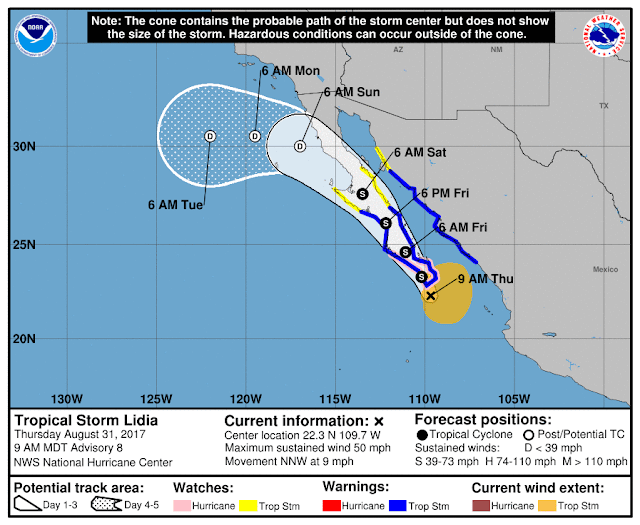 Current NHC forecast for Lidia from NHC (above) takes it up the spine of Baja before weakening and turning westward about 30 degrees north. Irma is forecast to become a major hurricane and head toward the Caribbean. An IR image (below) from 7:00 am MST shows that Lidia has a very large cloud shield as it approaches Cabo San Lucas. There continues to be considerable uncertainty regarding the northward path of Lidia, and recent forecasts have trended eastward and northward. This uncertainty is illustrated well by the 06 UTC GEFS plumes for QPF at the airport. The amounts forecast by the various members range from zero to a wet outlier at 1.6 inches. The main thing of interest is that the operational GFS produces one of the driest forecasts. The 06 UTC WRF-GFS (driven by the operational model) forecast for rainfall (below - on the 5.4 km grid) keeps southeast Arizona mostly dry, with main impacts of storm staying west of the Colorado River. Will be interesting to watch how all this plays out in the real atmosphere. Yesterday was the third day with very little thunderstorm activity over lower elevations of all of southern Arizona (24-hour detected CG flashes, above ending at 2:00 am MST this morning - from Atmo and Vaisala). Total PW analysis from MIMIC above is for 7:00 am this morning - for calibration current 12 UTC values were: TWC 1.27", Yuma 1.23", and La Paz 1.85". 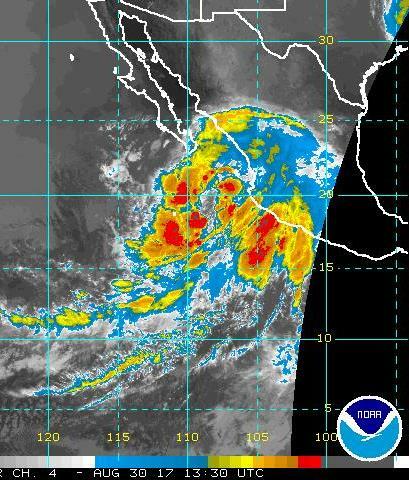 The strong moisture gradient north of the developing storm lies very near La Paz, Baja Sur. 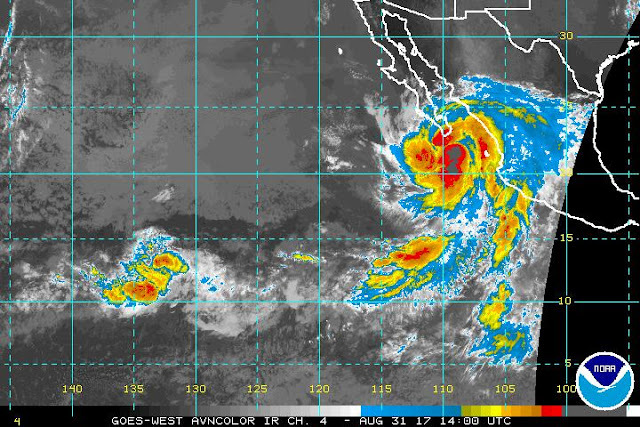 Center of the disturbance is is near 25 degrees north, over the ocean east of Cabo Corrientes, Mexico, as per IR image below from 6:30 am this morning. Morning forecast from NHC is above and keeps center of storm along west coast of Baja through Sunday and then turns it west, as 500 mb anticyclone blocks further northward movement. However, the WRF-GFS from 00 UTC last evening brings the storm into the mouth of the GoC and keeps it trapped as it moves slowly northward. The forecast below is is of PW and valid at 6:00 pm a week from today with the storm at the north end of the GoC.. Vastly different forecasts and possible impacts for southern Arizona. Lidia will be main feature of interest as we approach the Holiday weekend. Had the air conditioner quit here in the casita yesterday afternoon and was too hot to do much out here this morning. Strange situation this afternoon - radar indicates large stream of echoes heading off to the west-southwest. Above is from CoD NEXRAD page for 4:37 pm MST. Visible satellite image below is for 4:00 pm, and shows only a few Cu around Tucson. Appears to me like there was a low-level chaff release at/near DM AFB this afternoon, since echo weakens rapidly above the second tilt. Wonder what was going on? The 500 mb anticyclone (12 UTC analysis above from SPC) remains very strong and anchored over the Great Basin. Strong easterly winds did indeed bring drier air yesterday, and models predict even stronger dryness during midweek. However, temperatures are quite cool at 500 mb, partly due to mixed layers extending above that level. Regardless, the cool air will allow mountain thunderstorms that will try to come southwest into low elevations, producing mostly gusty winds. Harvey remains nearly trapped and has now shifted southward over the GoM coastal waters and will continue to produce heavy rains as it shifts slow east and northward during the week. Our next best hope for a return of more moist low-level air lies far to the south. 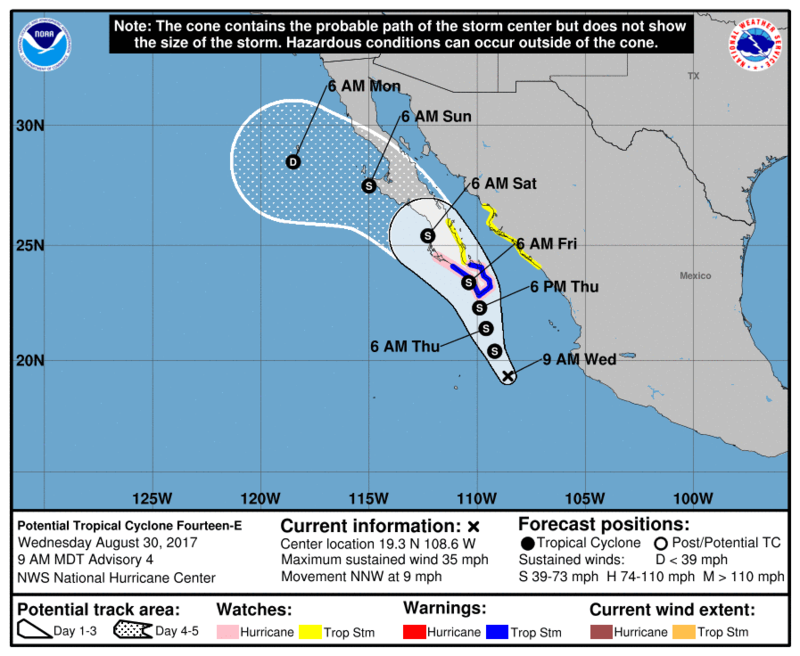 The long term models (below is from 00 UTC ECMWF) all forecast a tropical system to approach the GoC - some bring it into GoC, while forecast below keeps it just to west of Baja by late Friday. The models all seem slow in moving the low-level, moist air with this system into southeastern Arizona - so something to keep an eye on. Unless I've lost track, this would be Hurricane Lidia, assuming that all goes as the forecasts go. Photogenic storms at sunset last evening. Tucson sounding from 00 UTC (above) indicates slight CAPE and actual storm activity was considerably more than I expected - WRF-GFS at 12 UTC was much better than 12 UTC WRF-RRx. Moisture remained at around 1.25 inches, rather than dropping as RRx model predicted. Detected CGs (below) from Atmo and Vaisala show 24-hours ending at 1:00 am MST this morning. Alert data (second below) shows rainfall for 24-hours ending at 7:00 am this morning. A decent event for eat half of network. We had thunder twice here (along with gusty outflows of 30 to 40 mph) - no rain with midafternoon storm, but one after dark produced 0.14". Airport had only 0.04" but nearby DM had 0.46". I think the multiple outflows and early afternoon moisture recycling from early storms played a role in the evening events. The 500 mb analysis for 12 UTC this morning (above) shows that TS Harvey is trapped between anticyclones over the Great Basin and the GoM. Rainfall amounts have reached over 20 inches in the general Houston area with very severe flooding under way. Our morning TWC sounding (below) had some problems but PW has increased relative to yesterday but little CAPE indicated again. Models forecast drying from east during day and no storms in our area this afternoon. Isolated thunderstorms returned to southeast Arizona yesterday, even though CAPE was quite marginal. The plot of detected CGs (above from Atmo and Vaisala) is for 24-hours ending at midnight last night. There were two isolated storms on the southern and western flanks of the Catalinas - these produce light rainfall at seven ALERT sites. The situation continues quite dismal and the 12 UTC WRF-RRx forecast from Atmo again indicates little activity for eastern Pima County. The sounding forecast by the model for TWC valid at 3:00 pm MST this afternoon (below) has reduced PW and no CAPE. Hard to know whether PW will stay steady at around 1.25", if so then chance of isolated storms is better than what model is forecasting. At bottom is model's forecast (on the 5.4 km grid) of total rainfall though 4:00 am on Monday morning. Really phenomenal amounts associated with Harvey over Texas. The plot above shows detected CG flashes over much of the West for 24-hours ending at 9:00 am MST this morning. 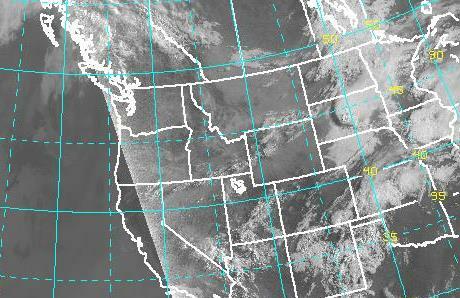 The lack of thunderstorm activity west of the Continental Divide is quite amazing for August. Most active area past 12 hours or so has been to right of path of Hurricane Harvey. Meanwhile the 00 UTC run of the WRF-GFS (below on 54. km grid) apparently forecasts a hurricane in southern GoC at 10:00 pm on August 31st. Hurricane Harvey visible image from 1415 UTC this morning over the GoM southeast of Corpus Christi, Texas. Image below is reflectivity from the Brownsville NWS radar at 1442 UTC. From NHC - current track forecast above and seven day rainfall potential below. 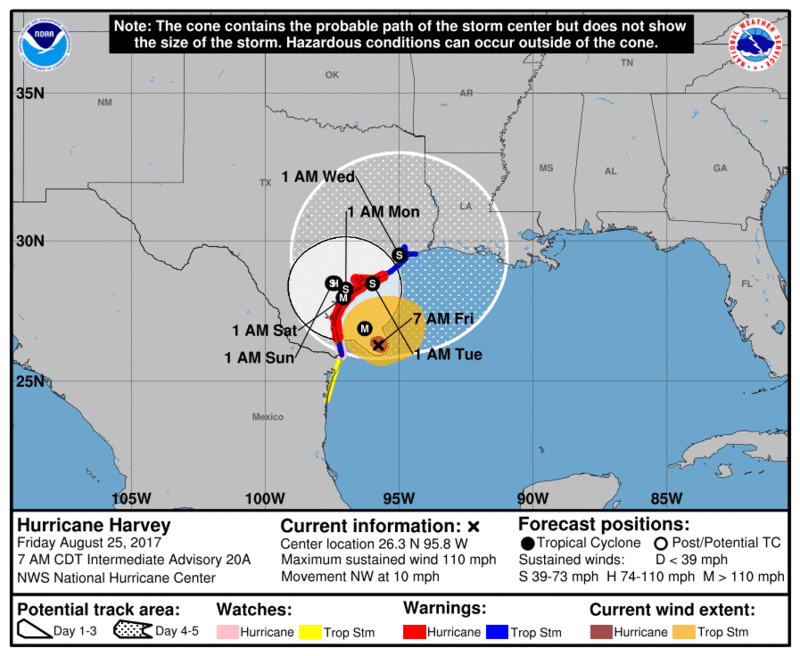 The threat for catastrophic flooding will be much more extensive than the high winds potential, since storm stalls along the Texas coast. Considerable threat for tornado occurrences also exists today into tomorrow. 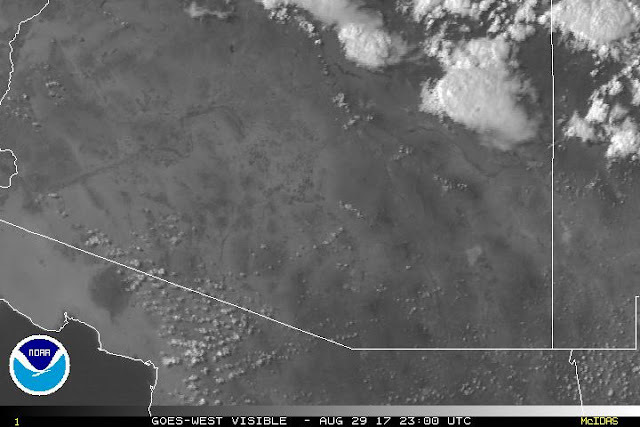 Active storm day yesterday over much of Arizona. Building storm above was at 3:00 pm MST - note that anvil from storms to south had already began to spread over the metro area (upper right). Image below is at 6:00 pm with light rain from thick anvils covering the field of view. Detected CG flashes (second below, from Atmo and Vaisala for 24-hours ending at 1:00 am this morning) shows an all too common donut hole over the metro area. The rainfall maps from the ALERT network (north above and south below for 24-hours ending at 7:00 am this morning) show widespread areal coverage of very light rainfall (mostly less than 0.15"), with heavy storm cores staying well southwest and north of the metro area. The heavy storm cells to south propagated toward the most unstable air, which was to the northwest, leaving the rest of us under thick anvil cloud. The airport reported 0.09", DM had 0.13", and we had much thunder here but only 0.05". The miserable synoptic pattern continues, following the passage of yesterday's short wave. Models currently forecasting little storm activity, except over some of the higher terrain, into the weekend. Curse The Synoptic Pattern And What Happens? Well I cursed the synoptic pattern yesterday and then saw isolated thunderstorms develop around the area. 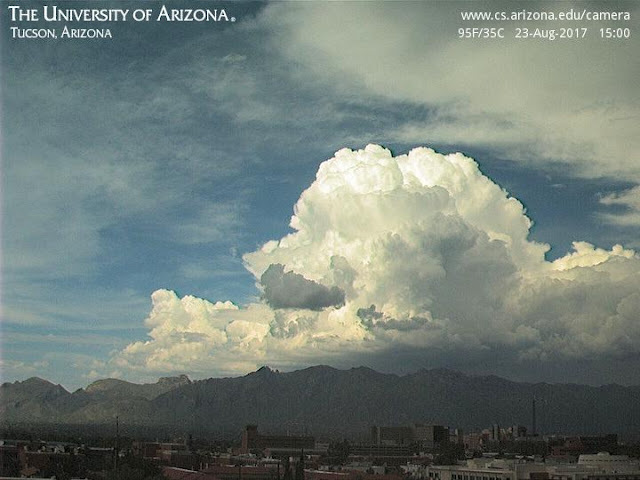 Image above from Kitt Peak looking south shows two of the storms at 5:35 pm MST. The plot of detected CGs below (from Atmo and Vaisala) is for 24-hours ending at 5:00 am this morning. We had thunder here from a small storm to the west, but only a brief spit of rain that wasn't enough to wet the the courtyard. Around the ALERT network only 11 sites measured light rainfall amounts of 0.04" or more, with a couple of sites having around a quarter of an inch along east edge of network. Certainly more activity than I expected with yesterday's nasty inversion aloft. It was still present at 00 UTC but it had gotten hot enough during the afternoon to let storms build by it - highs around 103 F at TUS and Atmo. The sounding this morning (above for 12 UTC) indicates a bit more CAPE today, even with the nasty inversion below 500 mb still overhead. The models have locked onto a weak short-wave that moves north from the huge data void of northern Mexico almost overhead by evening. Satellite loops this morning do indicate that this feature is down there, so a more interesting day on tap. I've shown three WRF forecasts from Atmo below that all show forecast radar echoes at 3:00 pm this afternoon: Top - the 15 UTC WRF-RRx from yesterday; Middle - 06 UTC WRF-GFS ; and Bottom - the same from WRF-NAM version of model. There is reasonable consistency in the forecasts, with all forecasting strong storms in eastern Pima County. These storms also produce a strong outflow in each forecast. The short wave, while quite weak, apparently brings some cooler air in mid-levels letting CAPE to increase substantially. This seems reasonable. But, I looked at the WRF-GFS 06 UTC forecast of the TWC sounding shown above - model had basically forecast no inversion as opposed to the actual observation. So, details of the thermodynamic vertical profile will be quite important as the day progresses. Finally, the vertical wind profile is not very good, since anvils from storms to south and southwest will stream overhead, so the metro area may be close but anviled-out. Another day to watch what evolves. Received the following email yesterday about Atmo observations during the eclipse. I saw something that you might be interested in. I was looking at weather chart summaries from the Department of Atmospheric Sciences here at the university and noticed that when we had a partial eclipse this morning, the air temperature stopped rising momentarily (the measured dewpoint also has a drop around that time, not quite sure if that is coincidental though). Doesn't seem like a big effect given the short duration of the eclipse but interesting nonetheless. The incoming solar radiation was just what we'd expect (above), as was the temperature (just below). But what is surprising is the large drop in dewpoint temperature at the beginning of the eclipse - around 7 F (green below). The time series for RH is at bottom. This seems counter to what might be expected, i.e., with decreased mixing the dewpoint might even increase a bit during the eclipse. I checked the observations at DM and TUS (note that observation time-series remain badly screwed up at TUS - this has continued for two weeks or so - not good) - and both sites experienced the drop in dewpoint also. So what was gong on? I also noted that winds at all three sites shifted to the west as the eclipse began. So, perhaps dry-air advection from west of metro caused the large drop in dewpoint. However, it is not clear to me why the winds shifted. Any other thoughts on this most appreciated. As for August weather - the synoptic pattern remains miserable, with the dominant 500 mb anticyclone to our south and southeast and shifting only slightly north during next several days. The warm air, in the mostly southwesterly flow above 700 mb, is producing a nasty inversion just below 500 mb. 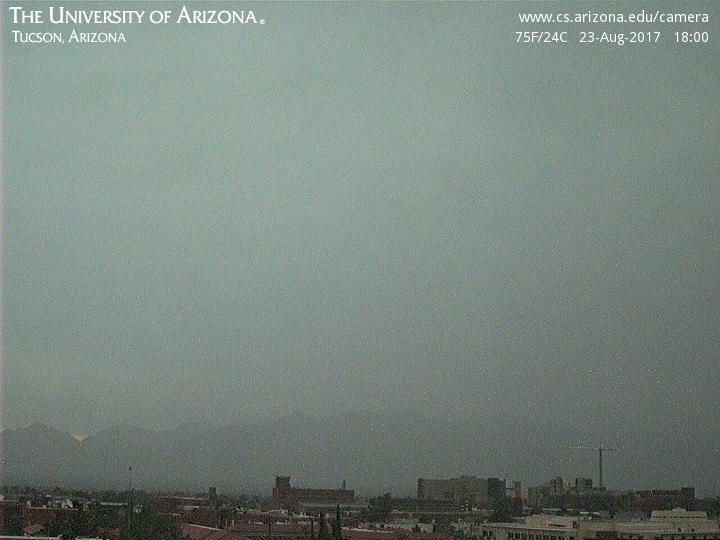 Isolated storms likely to return to Cochise County but more grim here at low elevations. August has been a real bummer of a month, after the record setting character of July. Last and only significant rainfall here at house was on August 13th. With slightly more than a week left in the month, I am wondering if the pattern will change enough to bring another significant period of storms to the metro area. Most interesting thing in long-range models is forecast potential for a hurricane affecting south Texas by the weekend. Yesterdays forecasts (me, NWS, and models except for 15 UTC WRF-RRx) seriously over-forecast the likely hood of thunderstorms for all of southeast Arizona. I thought mountain storms would occur and inch westward, closer to Tucson, NWS had 30% POPs for measurable rainfall at the airport last evening, and most models also had rainfall over portions of southeast Arizona. The exception was the WRF-RRx which forecast absolutely nothing, which is what occurred. The suppressive impacts of the weak short wave that pulled northeastward toward Colorado were much greater than anticipated. So it goes in summer forecasting. The 24-hour plot of detected CGs above ends at 1330 UTC this morning (from Atmo and Vaisala) - note that the lack of thunderstorms covered a huge area extending from southern California eastward across New Mexico. The WRF forecast shown in previous post was really bad across New Mexico. Luckily for most weather folks, today's eclipse is absolutely top news, allowing yesterday's lack of storms and rain to be totally ignored. Dry air encroaching from the west at lower-levels, and dry air already aloft, make it look a repeat for next day or two. This morning's sounding plot for TWC (below) is even more miserable than yesterday's. As for the eclipse - the early morning visible image (above from 1330 UTC) shows most of the Northwest clear and only one band of clouds from south Idaho across northern Wyoming as a potential trouble-maker. Things much more iffy from Nebraska eastward. 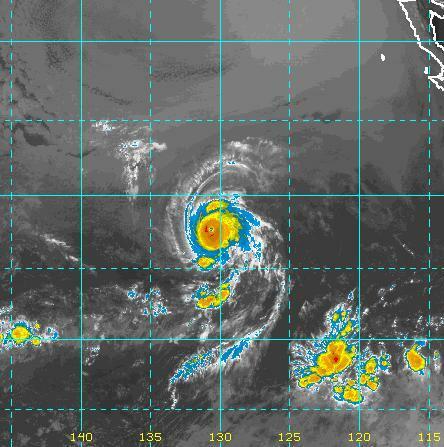 Mean while, far out in the Pacific, hurricane Kenneth has strengthened to a Category 4 storm - IR of Kenneth below also from 1330 UTC. East Winds Today - Impact?